Nice to see your project coming along. 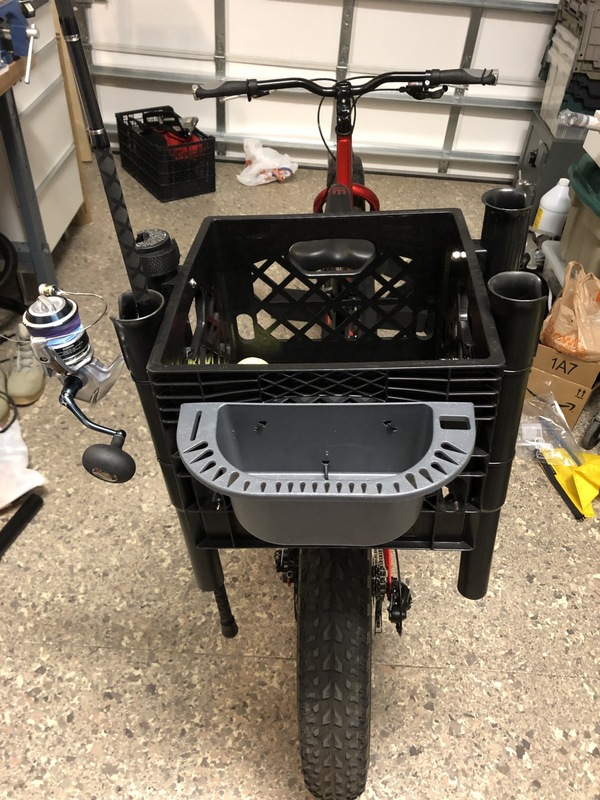 I also use the click stand and I use an empty water bottle (a little one) for the base when parking on the sand so it doesn'r sink in. I also carry a few extra smaller bungies for locking the brakes. Keep it going! Good plan. Should work just fine the way it is. Cool stuff! I love seeing people ride dem fatties on the beach in the fall when I visit to surfcast. For those who are adding aftermarket motors, be careful with the lithium batteries as some can explode; if you use C02 canisters they can explode too and it can be a bad, burning scene. Here is my fattie, but I never took her on the beach yet and probably has too many linkages to add rod holders and baskets, etc.. She climbs like a goat, and descends like a rocket... well, a porky rocket. That’s what I,m talking about. 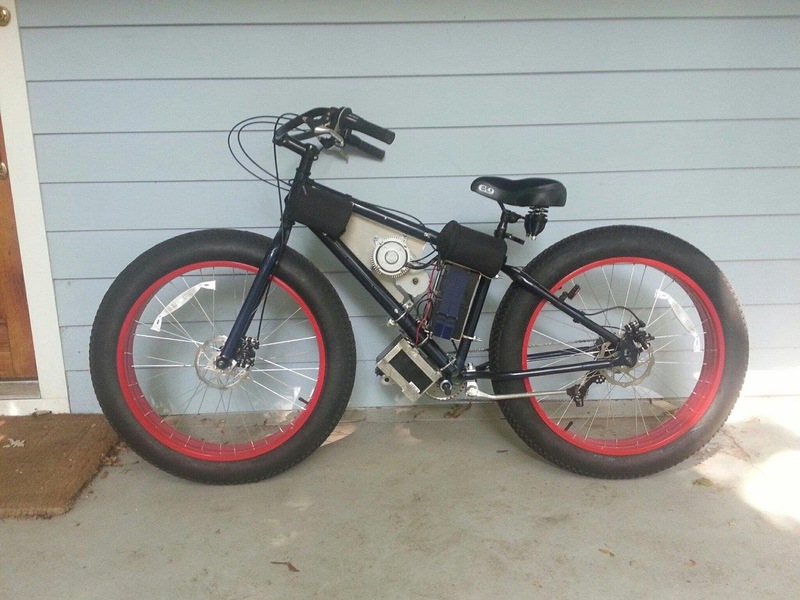 Electric fat bike for the beach. I almost did this very thing a couple years back but was worried the salt would kill it quick. How long have you had it. How is it holding up. 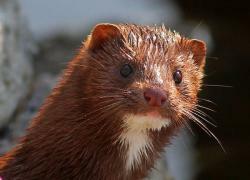 we built it 3 or 4 years ago, whenever the mongoose came out. its pretty good. Have you looked at the Dakota Lithium batteries from electric-bike-kit? 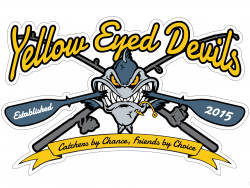 They have all sorts of battery backs and kits for bikes, fish finders, trolling motors, etc. I bought one of their lithium batteries for my kayak fish finder last year and it's so much lighter and lasts a lot longer than an SLA. Their prices seem to be pretty competitive and the batteries all have active BMS protection circuits. As a bonus they are built in the USA. Quick update. Rack has been mounted and crate mounted to that. I used zip ties for the crate, for now. Will consider bolts and wingnuts the first time I say I wish I could take it off. Playing with rod holder positions so some bolted, others zip ties. From eBay I bought two barely used Maxxis tires and lighter tubes. I am going to swap those before taking the bike to the beach. Looks great...and heavy! If you fill that crate you’ll be wheelying down the beach! The wing nuts are a good idea in case you need to jettison the load. If you are going to swap the tires you should consider going tubeless before you put the new tires on. Most rims can be converted for a few bucks. You can run lower pressures without the risk of pinch flats and it’s lighter. Getting the old tires off can be difficult. If you can’t easily get them unseated, lay the wheel on the floor on a piece of cardboard and walk on the sidewalls with some stiff soled shoes or boots. 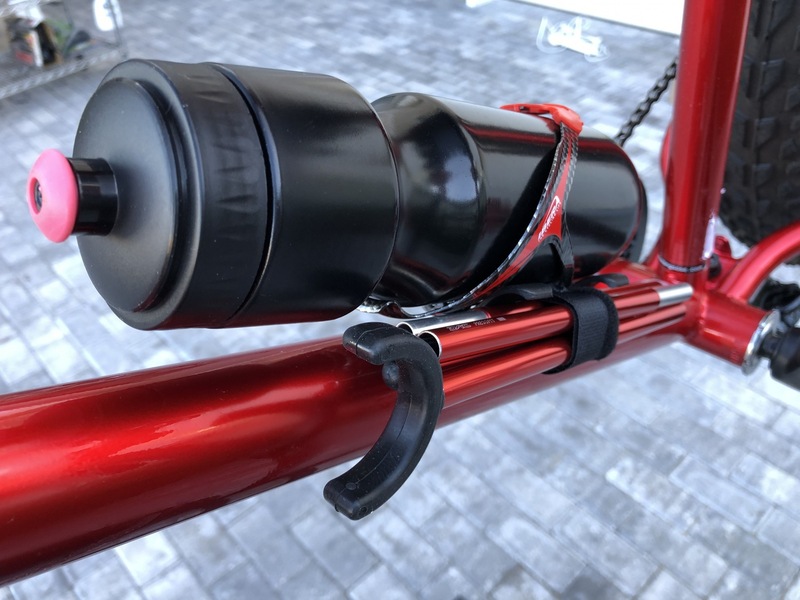 You’ll also need some plastic coated metal tire levers that you can hook to the spokes to get the tires off all the way. If you go with tubes with the new tires, be careful about pinching them if you try to pry the tires on with tire levers. Putting a small amount of air in the tubes (enough so they take shape) helps keep them out of the way and makes it easier to put the tube on. Put one side of the tire on, then fit the partially inflated tube inside and on the rim before closing it up. Good luck! @beerdoh - Thanks. The crate is more a pltfoem for the rod tubes than a conveyance of heavy gear. But I get the point and will monitor. I hear you on tubeless. Baby steps. The Maxxis tires are less aggressive than the factory so that should reduce rolling resistance some. I think I will also knock off a couple pounds of weight. The Maxxis are 60 TPI and not designated tubeless ready, though they are foldable. So they should be able to be run tubeless. I bought a new pair of Surly rum liners which are designed to run tubeless. And I have plenty of Gorilla tape so just need the sealant if I go that direction. I worked in a bike shop as a teen so have changed out my share of tubes. Know plenty about pinches, more than I should. Pry bars are in order as well. I couldn’ convert my 26” Surly Marge Lite rims with Surly Nate tires into tubeless without using a Fatty Striper latex band. They held after that but one stopped holding air this summer, so I had to use a tube. I did buy a pair of 24x4 inner tubes that I will use next for a split tube method. Seems silly to use a split tube and sealant since there will be no weight savings at all, but then I can at least run low psi again (4-6psi). Been thinking about tubeless so I am going to pick your brain. Assuming the Surly rim strip covers the holes, what tape do use to seal? Also, Orange or Stan’s sealant? And what valves did you use? Anything special? Take my advice. It's ghetto tubeless or split tube, or fatty striper. The gorilla tape method is a waste of time on fat bike rims. It just doesn't work very well. There is somewhat of a weight savings because you use a 24" regular tube. 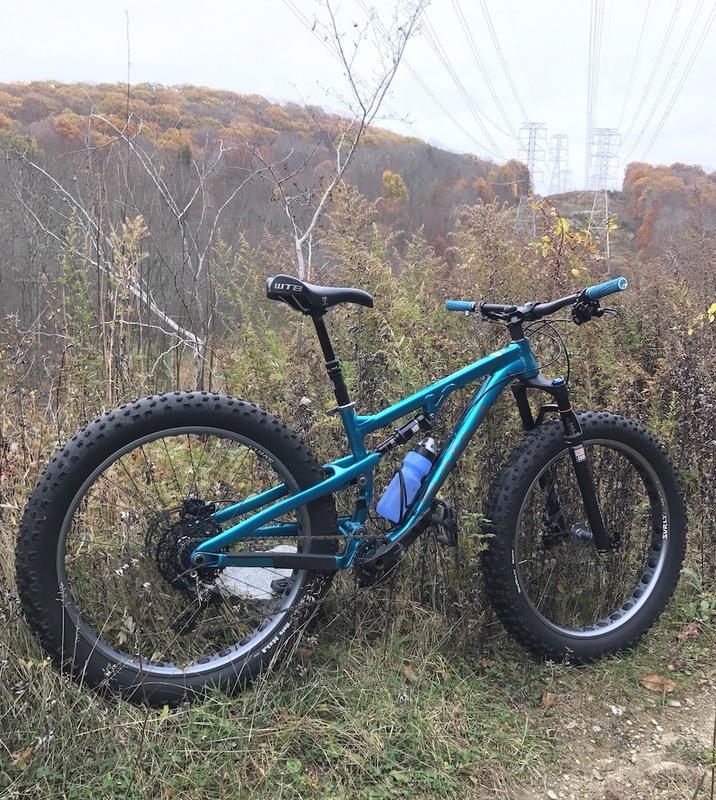 The fat bike toobs weigh 2 lbs. each. So right there you can save probably about 2+ lbs off the bike. The real advantage though is that you can run really low PSI and have flat protection. If you really want to do it right glue the tube to the tire with rubber cement. Then you make a sort of tubular type tire. make sure your wife knows you bought it vs her thinking you hit the strip joint. I think I bought fat specific valves but can’ recall the brand. 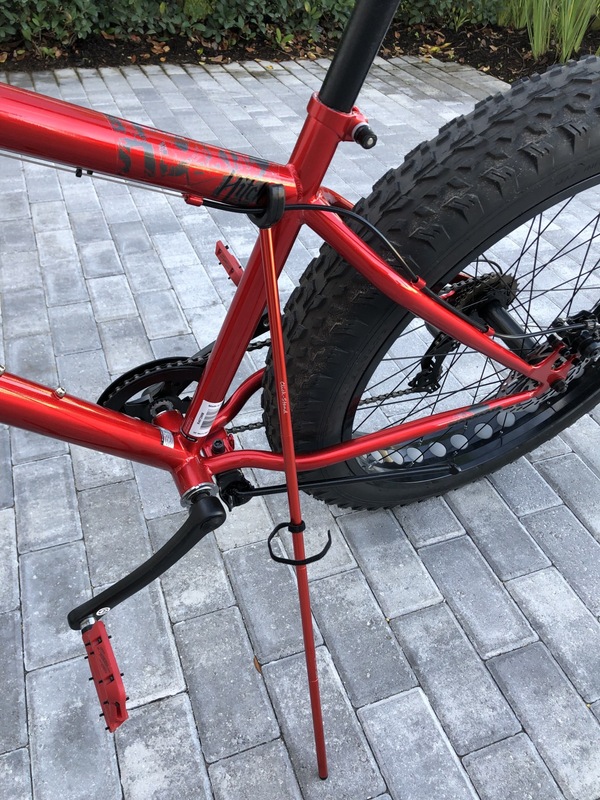 Agree; I’ve tried using foam backer rod w/ fatty strippers and it failed on one wheel. I bought a roll of the 8” wide pink foam insulation roll to buld up the bead area but if I use the split tube method I won’t need it. 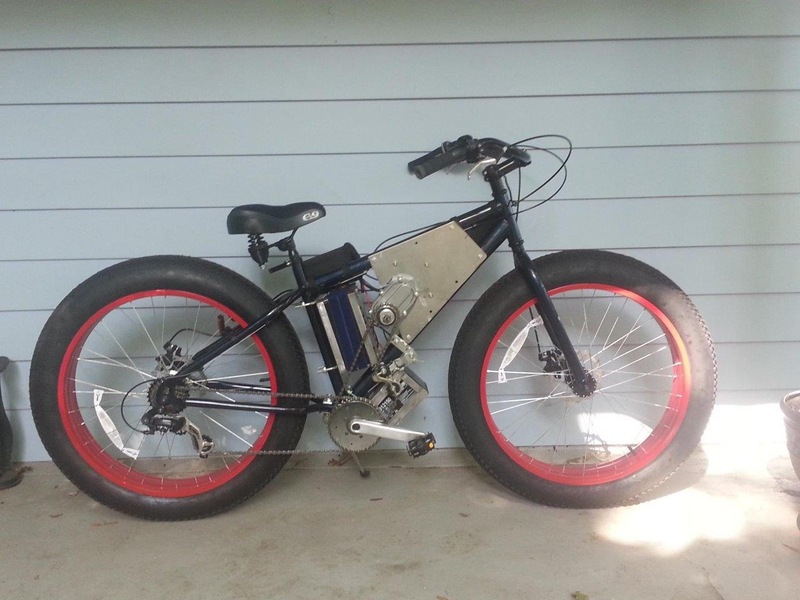 MTBR dot com’s fat bike forum is great for this kinda info, as well as the wheels & tire forum. Now you guys are scaring me off. No, seriously, not scared, just questioning my desired endpoint and what it will take to get there. This entire project was supposed to be a test, a proof of concept, not perfecting the setup before its used. Baby steps. 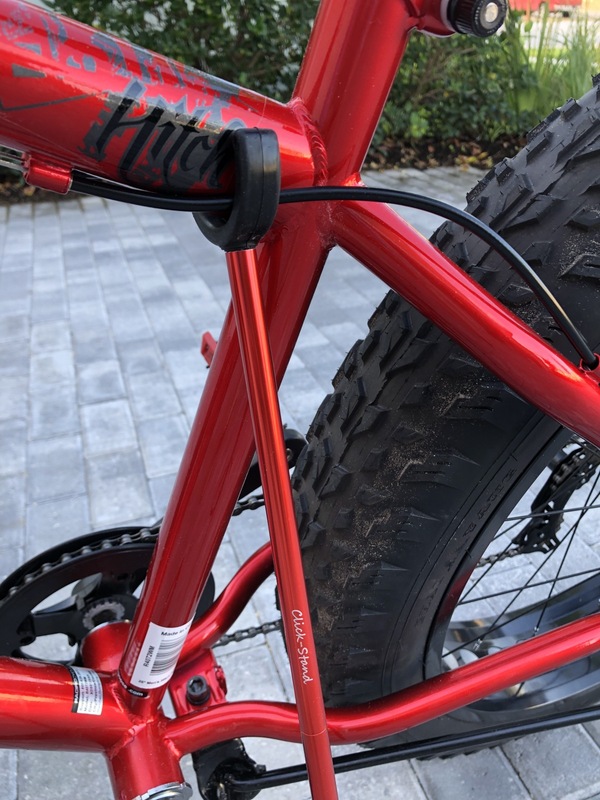 If it works, and I can justify the cost vs benefit/enjoyment, then the WalGoose is replaced by a real fat tire bike with all the right gear, including TR rims and tires. 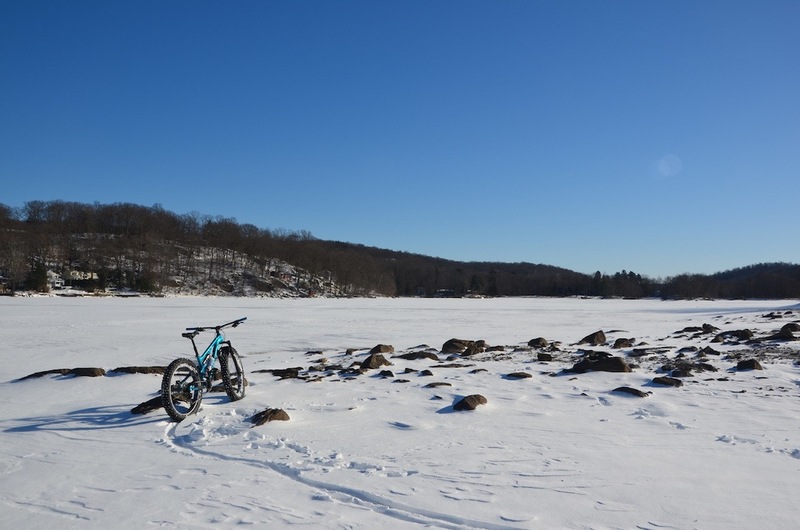 I should just swap out the WalGoose factory tires and tubes, install the Mamouths and lighter tubes and ride the damned thing first. See how low I can go with pressure, whether that combo self-stears too much and how it all rides on our sand. The weight savings, while 2-4 pounds, it not going to make or break this. Whether the bike is 44 pounds stripped or 40 is not going to change the experience that much. 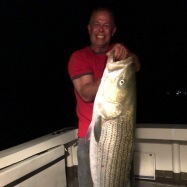 I weigh 205, rods, lures, gear, rack, crate, etc and 2-4 pounds becomes less relevant. Appreciate the advice but I need to put that one on the back burner for now. I've been running at 5lbs with tubes and get along pretty well but would like to try going tubeless for less weight and perhaps a little more float at lower psi.